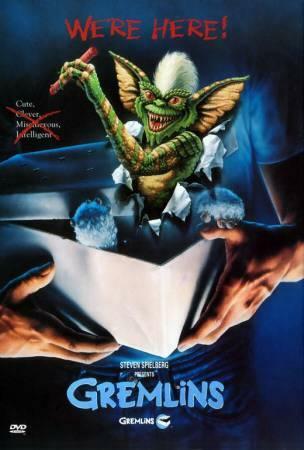 As a gift from his father for Christmas, Billy receives a “mogwai” called Gizmo as a new pet. He’s given three rules for looking after him: don’t let him out in sunlight, don’t let him near water and don’t give him any food after midnight. Of course, with Billy being a stupid boy he breaks the rules almost immediately, and chaos ensues. Now, you may have noticed I’ve put this down as one of my Christmas Crackers. While I am 100% certain, no doubt in my mind, that Die Hard is a Christmas film, Gremlins falls into that same category of debate but is a little trickier. My usual two factors for deciding are 1) The setting of Christmas is vital to the plot; and 2) It contains Christmassy themes such as family, redemption and coming together. While I would say that Gremlins fulfils the first criteria (Billy receives Gizmo as a Christmas present, so Christmas provides key context to the plot) it doesn’t really contain any of the key Christmas themes. So it’s still up for debate but as it’s the Christmas season I’m feeling generous. The film itself is a good caper, but it’s not really hugely gripping from beginning to end. The first half is good, with the mystery of the mogwai and finding out more about them, but once the mogwai have become “gremlins” the film is basically just scenes of the chaos they cause with a bunch of random characters coming in and out chasing after them. The final climax is over quickly and there’s not much suspense. So it starts well, but after a while I got a bit bored and I think it could have done with reaching the end quicker. I’ve mentioned that the film doesn’t contain the classic Christmas themes of reconciliation or redemption. Billy is completely useless and he doesn’t seem to learn anything at all by the end. He’s terrible at looking after Gizmo- he forgets the rules straight away, and when Gizmo has water splashed over him and he starts writhing in agony, Billy just ignores him. He doesn’t manage to kill any of the gremlins by himself either- his mum kills loads and then he only manages it with the help of his love interest. Then at the end, he thinks he’s responsible enough to keep looking after Gizmo?! No lessons learnt or character improvement whatsoever. Billy, you’re just the worst. What I did like was the mogwai/gremlins themselves. There’s something sinister about the puppets they use which is really effective (as they actually are pretty sinister- they actually kill a few people…), and I’m glad that this film came out before CGI as I don’t think CGI creatures would have had quite the same creepy effect. Overall I would say it’s a family film but certainly for small children it could be pretty scary. From the 1980s Golden Age of cinema, this isn’t one of the best but is worth a watch. Gizmo is very cute (and marketable…) and it’s an interesting concept before the mayhem gets a bit over-the-top. I’m slightly leaning towards the side of not a Christmas film, but perhaps worth watching earlier on in the season before going full-on Christmas. Popular local figure Steve becomes frustrated when a new neighbour, Buddy, moves in across the street and rivals him for the title of the town’s “Christmas guy”. Buddy is determined that his house is so lit up with Christmas lights that it can be seen from space, however Steve won’t let that happen. 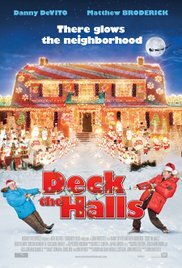 While Deck the Halls will never quite become a Christmas classic, it’s an enjoyable if perhaps low-quality watch. Overall it’s a pretty rubbish film by usual standards, but I did enjoy it and I certainly felt Christmassy watching it. I laughed out loud a few times, and while much of the comedy is basic slapstick it’s not too over-the-top. The plot is a classic Christmas movie setup, with the two main characters learning some life lessons and everything ending up right in the end. There are certainly better Christmas films out there but this is worth a watch, and I would probably watch it again (although it won’t be an annual feature of my Christmas viewing list). It’s lightweight and family friendly, so good for a cosy December evening in. The Pumpkin King of Halloween Town, Jack Skellington, becomes tired of doing the same thing every year for Halloween. He stumbles across Christmas Town and is taken in my its magic, and decides to take Christmas into his own hands this year. However, it doesn’t go quite to plan and he needs Santa to save the day. It’s one month until Christmas everybody!!! And that means I’m back onto my annual Christmas Crackers series- which in 2016 included a grand total of one whole review, so if I can beat that I’m doing a good job. 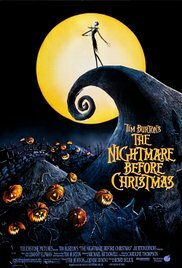 Anyway, I thought I’d start with A Nightmare Before Christmas as, to be honest, it’s pretty early in the year to go full-scale Christmas so this Halloween/Christmas crossover is a good compromise. 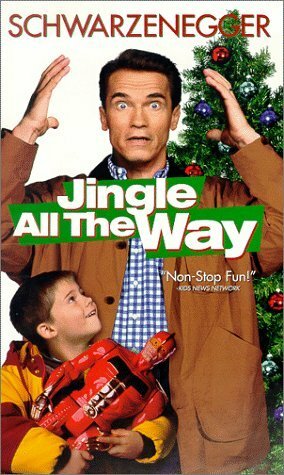 As far as Christmas films go this one’s not really particularly Christmassy, which was a bit of a let down, but like I say it’s still early so I’m willing to let that slide. Plus, if you usually hate sickly-sweet Christmas films then maybe this one’s for you. I did enjoy it and it’s not too Tim Burton-esque compared to some of his other seriously weird stuff (he was the writer for this), in that it’s not hugely creepy or sinister, which does certainly make it for family appropriate for this time of year. The animations are very cool, and there are lots of little details with the characters and the sets which are fun to spot. Plot-wise it’s fairly predictable, but it’s not very long and it kind of makes a nice change to not have too much squashed into one film. The blossoming romance between Jack and Sally is a little forced towards the end and the plot would have worked without the romantic angle- but still, it’s a festive film to you kind of need something like that. But really the film is about the animation and design, which is top-notch. I liked this more than I thought I would and it works as a family film as it’s not quite scary enough to put off kids. It’s worth a watch as it’s fun and a bit different from your usual Christmas film, but just don’t save it until Christmas Eve. A father wrapped up in his work forgets to buy his son the one gift he wants for Christmas, leaving him only Christmas Eve to track it down. However, it turns out everywhere is out of stock and he’s not the only one looking for a last minute gift. Another year, another addition to my seasonal Christmas Crackers series, this time featuring the thrilling combination of the Terminator and young Anakin Skywalker. Let’s just say T + AS does not equal GA (good acting). Having said that, literally no film ever made can be worse than The Santa Clause, last year’s Christmas horror, so it’s not all bad. First things first, before whiney Jake Lloyd desecrated the Star Wars universe with his incessant moaning, his whinging actually makes him an ideal casting choice for this role- the classic demanding child growing up in a world of consumerism who only wants material objects to make him happy. There must be a Christmas lesson for him to learn in there somewhere! And there is. I don’t think it would be classed as a spoiler to say that by the end of the film both father and son learn that Christmas isn’t all about the presents, but about family. Poor acting aside, I did laugh a few times in this film. It’s quite slapstick which produces a few amusing moments, plus I did laugh at the (unintentional) dry delivery from Arnie. It’s not a Christmas classic, but I didn’t hate it and if it was on telly on a free Saturday afternoon next December, I would probably watch it again. This film gets no points for things like originality, acting or cinematography but it’s mindless and inoffensive, plus it’s Christmas and at this time year people will watch anything. Worth a go if you’ve already watched all the classic seasonal hits and need something else.